Can you tell how every campaign is set up by looking at your ad accounts? What product is it promoting? Who is it targeting? If not, you might want to consider creating a process for naming your campaigns like a pro. Keep reading and I’ll show you how to do it. When naming campaigns, the most important thing is to be consistent. Having a thought out process and naming convention keeps your ad accounts structured and makes managing them easier. The process varies from marketer to marketer, but it is still vital to have one. Unfortunately, many marketers lack a strategy and instead rely on coming up with campaign names mid-flight. This results in a messy, unstructured, hard to handle campaign structure that makes you miserable in the long run. Further, you can enrich your campaign names with custom variables. The variables that you should include to your campaign name depends on your industry as well as what, where and to whom you're selling your product. In this post, I’m going to show you how you can create a process for naming your campaigns in a way that saves you time and provides you with multiple other benefits such as enhanced filtering, grouping and a better overview. Additionally, I'll list some of the most commonly used variables by marketing pros and show you how to create a coding frame. We've also built a campaign name and URL builder tool (it's free) that makes creating structured campaign names and URL's super-easy. Feel free to try it out once you've read this post. Maybe one of the most common ways naming an advertising campaign is the ad hoc way. The ad hoc way refers to coming up with campaign names out of the blue while building new campaigns. Marketers, in general, are busy and coming up with a good descriptive campaign names is often overlooked. Firstly, not having a process in place requires you to get creative every time you create a new campaign. This doesn’t only take time but also takes your focus away from more important things. Secondly, your advertising account will be filled with campaign names that may have made sense to you at the moment, but after a while doesn’t provide you with many insights. And even if the name would make sense to you it might look like gibberish to other people working in the account. I bet that in one of your ad accounts. there's a campaign named "spring sale", "Xmas campaign" or "campaign #1" or something to that effect. Don’t worry, so do most of us. However, by investing 15-30 minutes of your valuable time in building a process, you’ll never even consider naming a campaign that way again. The love for data and structure has lead digital marketers to come up with a structured data driven way of naming their campaigns. To keep hundreds of advertising campaigns across different advertising platforms organized, you’ll need a process. This process consists of setting and following a hierarchy, selecting variables and separating variables with a ‘separator’. Campaign naming convention refers to the name you give your campaign in your advertising account. Even if the account structure varies from platform to platform, most advertising platforms use ‘campaign’ to gather advertisements, sharing the same theme or targeting, under the same roof. The basic idea with a campaign name is to give the advertiser an idea what the goal with the ads in the campaign is, the audience the campaign is targeting and which product it is promoting etc. Before naming your campaign, ask yourself the following questions: “What is the purpose of campaign naming? Does the name have sufficient information to give me an overview of the campaign's purpose and setup? Can other persons working in the advertising account interpret the campaign names? What do I want to measure and does the name help me with my analysis? Does this campaign share attributes with other campaigns? How can I group the data from these easily? Creating a process for campaign naming convention saves you time, helps you gain better control over your advertising campaigns and makes it easier to analyze the data. In addition, using the exact same campaign name in your UTM campaign tags allows you to slice and dice your data any way you want and gain valuable insights from it. 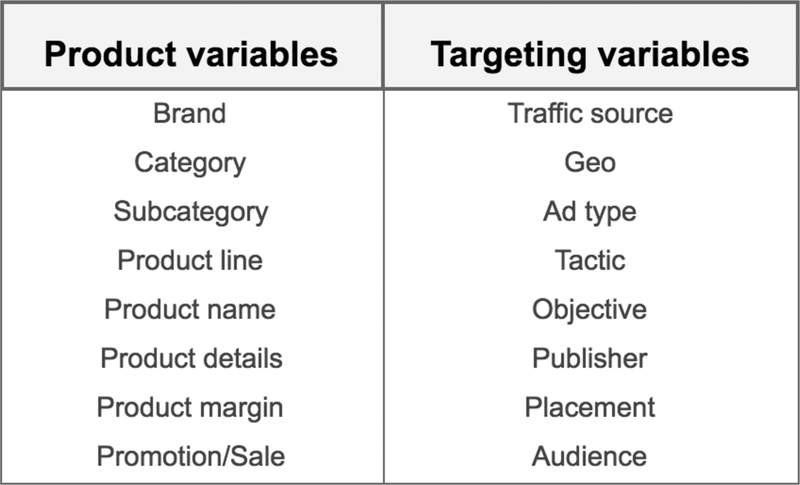 Different ad platforms might require slightly different variables depending on the targeting and campaign structure. In Google Adwords, you might want to include ad type in your campaign name whereas in Facebook Ads you might go with an audience variable. You can break down variables into two categories by the information they provide. Geo: your geographical targeting. This allows you to compare the performance of different campaigns promoting the same product but in different locations. Brand: In our case, the brand we are promoting is Nike. One commonly used way of structuring Adwords campaigns is to create individual campaigns for each brand. Product category: If you’re selling several different products for each brand it might make sense to include product category to your campaign name (You can even go one step further and break your campaigns by subcategory). Anyhow, your e-commerce store is selling several different types of Nike shoes so you want to include product category name in your campaign name to get a better overview how different categories are performing. Product: If you only have a couple of products you could consider having a designated campaign for each product. When dealing with hundreds or thousands of products, this might not be feasible. In those cases, you should consider using a feed based solution. To improve readability you should use separators between the variables. Whether you use a “-” or a “|” doesn’t matter. Just pick one you like and stick with it. Using separators is also handy when filtering or using Regex to create grouping rules. There you go - it’s as simple as that. Just remember to stick with the variables you’ve chosen and always place them in the same order. This way everything in your ad account will stay organized. Traffic source: If you’re advertising in several different advertising channels you should consider adding the ad platform name to your campaign name. Ad type: As an e-commerce marketer you’re most likely utilizing most of the ad types Google Adwords has to offer. If you’re using remarketing, display ads and shopping ads, you may want to add ad type variable to your campaign. Brand/Non-brand: Brand bidding is a pretty common practice for advertisers to secure top positions in the SERP. This is especially useful if your SEO isn’t top notch or if you want to avoid your competitors piggybacking your brand name. Anyway, creating a brand campaign is a good way of doing this. Having the term “brand” in your campaign name allows you to distinguish brand campaigns from the non-brand campaigns. Margin: The products you’re selling can have different margins and thus you might want to group these products by adding a margin variable in your campaign name. Objective: When running several campaigns with different key objectives include the campaign objective to your campaign name. Product details: If you’re looking for a more detailed approach, you could consider adding products details like color, size or material to your campaign name. Publisher/Placement: When running publisher/placement specific campaigns, add publisher or placement to your campaign name to easily compare performance. This is especially valuable when running programmatic campaigns. Sale/Promotion: Add Sale/promotion variable to campaigns promoting seasonal offers or sales. Targeting/Audience: This variable might be good to have when targeting a specific audience. For social media marketing, this is essential to get a quick overview which audience is performing best. Once again, the most important thing is to create a system that helps you to get a better overview and saves you time. 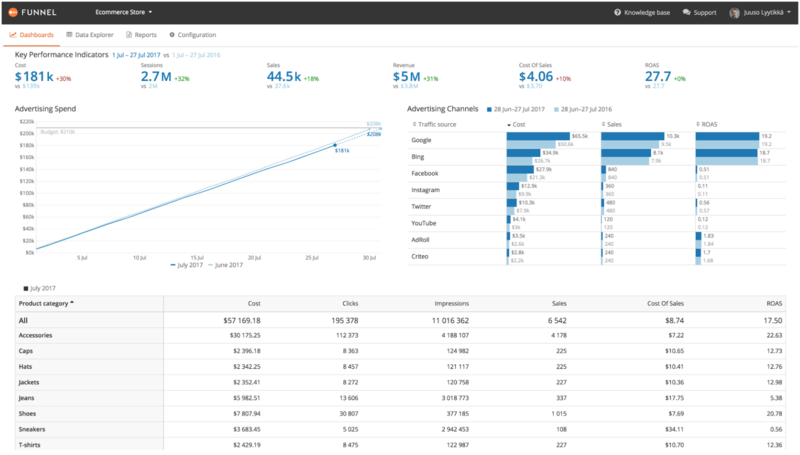 Overview: When all your campaigns follow the same naming structure you’ll get a better overview which allows you to spot trends faster. In addition, you can easily see if a product category is performing well on one advertising channel and boost advertising of this product category on other advertising channels. Control: When your ad accounts keep growing into tens if not hundreds of campaigns they can become unmanageable without a consistent naming convention. Once you’ve decided the variables you want to use, stick to them. Also, remember to arrange your variables hierarchically. Start with the broadest variable (e.g. geo) and move to step by step towards the most narrow variable. Analysing/Grouping: When all your advertising campaigns are neatly named doing ad hoc analysis is easier. You’ll find the data you need in the blink of an eye and hence can focus on the analysis rather than spending valuable time on finding the right data to analyse. Using the same naming convention and structure across all your advertising platforms allows you to group campaigns sharing the same theme and analyze which advertising platform has the best product channel fit. Filtering: Being able to do filtering by variable might be one of the biggest pros of having a good naming convention. Just type in the variable name in the ad platforms filtering field and start analyzing. Reporting: If you’re running ads on several ad platforms, having good naming conventions can save you tons of time. Whether you do your reporting in spreadsheets, Data Studio, Google Analytics or in another reporting solution, good naming conventions opens up opportunities to group your data and report for example by market, ad platform, product or any other variable you’ve chosen to use. When running ads on several ad platforms you might want to consider using a tool like Funnel to automate your reporting. See ROI on Product Category level by using Category variable in campaign names. Shareability: When you’re several people working in the same ad account pre-agreed naming conventions are a must. In addition, if you’re working with an agency introduce them to your naming convention and make sure they follow the exact same structure as you do. This way, if your company one day decides to change agency or to move everything in-house the transition will be painless. There are a couple of good utm-builders you can use, Google’s own Campaign URL Builder being one of them. If you’re new to UTM tagging or would like to refresh your memory, we’ve put together UTM tagging guide for you. 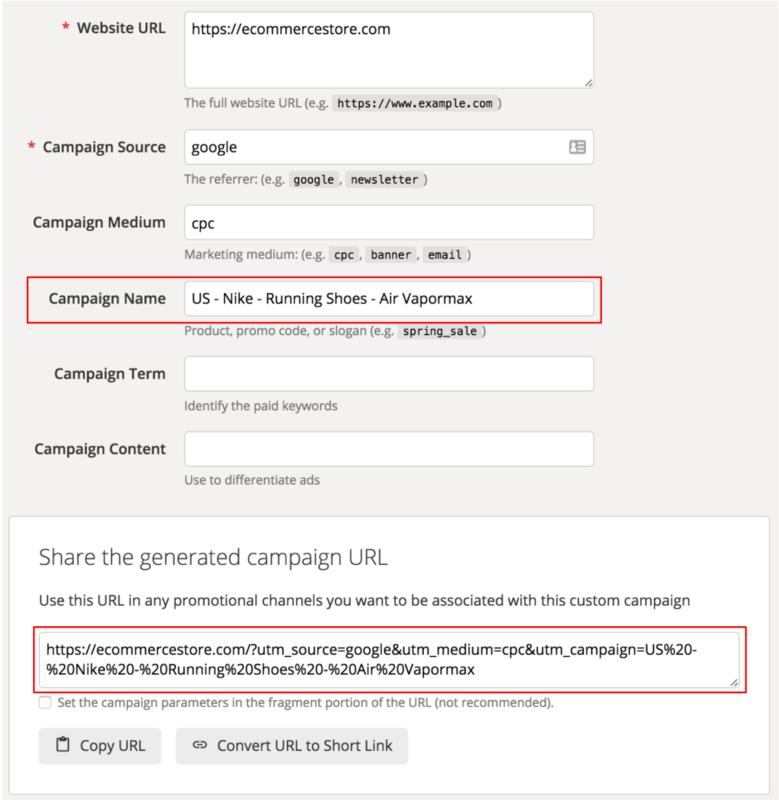 Just copy your campaign name from the ad platform and paste it into the utm_campaign field and the URL builder generates you a correctly UTM tagged URL. This way Google Analytics can do a great job showing you campaign performance data. 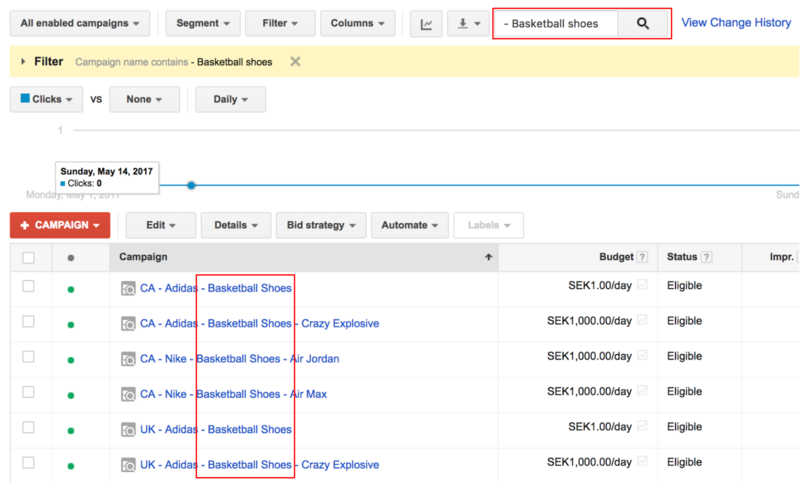 If you’d like to see ROI per campaign in Google Analytics you’ll need to import cost data from your ad platform. You can upload it manually or use tools like Funnel’s Google Analytics Uploader to automate it. 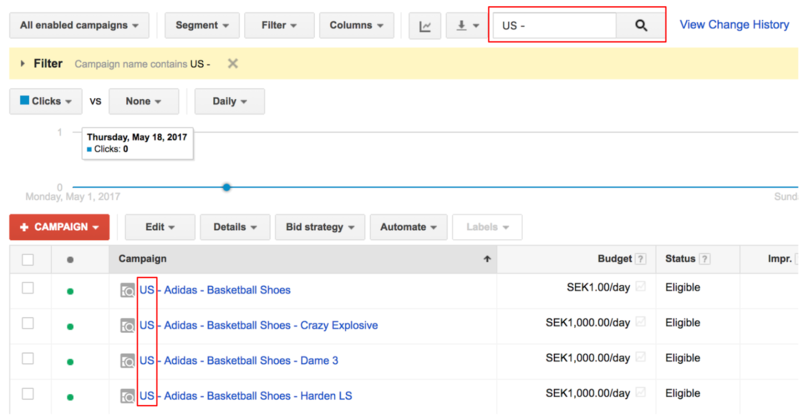 Read more about what you can do with cost data in Google Analytics once you’ve imported it. Once you’ve decided the variables you’re going to use, consider creating a coding frame. This isn’t obligatory, but having a good coding frame has several benefits. Firstly, coding the variables you use makes the campaign name shorter and thus scanning of the ad account easier. Secondly, by coding e.g. targeting or audience variable you’ll make it hard, if not impossible, for savvy competitors or users to see the targeting you’re using and why they saw the ad. Further, you can avoid embarrassing situations by coding your campaign variables. For example, you might want to segment your customers into high, mid and low value, and add this variable to your campaign name. This can be valuable information for you but your customers might not appreciate being categorized as “low value”. You could instead of “low value” encode it and call this segment “LV”. The same goes for other variables. Just remember to keep it simple and be consistent across all your ad platforms. The general idea of using a structured naming convention is, after all, to save time and make your life easier. Keep it simple: the idea with campaign naming conventions is to make your life easier. So avoid building an overly complicated naming structure. Preparations: put some thought and effort in deciding the variables you want to use. This will save you a lot of time in the future. Be consistent: once you decided the variables you are going to use, stick to them. Start now: the sooner you start using a consistent naming structure the sooner you’ll get a better overview of your marketing efforts. Hope you found this guide useful! Share your thoughts in the comments below.